Nokia Lumia 830 - Microsoft Smartphone Devices - is a high-quality photographs taken both by day and by night, a wealth of possibilities to edit or PureView technology to guarantee great quality photos. The Lumia 830 is equipped with a camera with a 10 MP sensor, ZEISS optics and Nokia Rich Recording Technology. 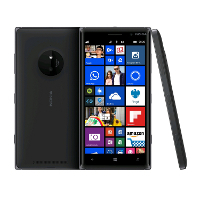 The smartphone runs on the latest version of Windows Phone 8.1 update Lumia Denim; offers users 15GB of free storage in the cloud OneDrive and pre-installed Microsoft Office Mobile. The combination of these functions gives you the opportunity to work with any mobile device - laptop, tablet or smartphone. The Lumia 830 is equipped with interchangeable color covers made of polycarbonate with the function of wireless charging. Quality and precision aluminum frame stresses surrounding the 5-inch HD screen. 1) You have to download software developed by Michael Chourdakis. Remember that entered PIN on the website must be exactly the same as PIN entered in the setup program on your Nokia Lumia 830.